This practical exercise is very much like Humpty Dumpty. It's a simple scenario, a simple JPG file fragmented in unallocated space. The complex part is that its in 35 pieces (fragmented) and they are not necessarily in order, and the FAT table is completely gone :(. Well, all the kings men couldn't put Humpty Dumpty back together again, but Daniel Walton from e.law Asia Pacific Pty Ltd (elaw.com.au) in Australia was able to put this highly fragmented, unusual JPG image back together and solve the puzzle. If this had been a real case, he would have been paid a large amount of money for doing almost the impossible. Great job Daniel!! I have recovered your number on the jpg. ##Can you hypothesize as to what happened to make the file "disappear"? It seems that the file was formatted by the mac pc. ###Can you articulate the status of the drive and what, if anything is different that a typical flash disk? now that is true for both partitions. Most usb drives only have 1 partition as windows will not display both partitions on a USB drive. The file was on the second partition , which wouldn't be visible on the pc if the first partition was formatted to a FAT or NTFS filesystem. So the first partition must of not had a FAT or NTFS filesystem or the partition was been deleted. The evidence had the following two partitions. With this setup the second partition will not be accessible under windows. For windows to mount the second partition the first partition must (a) not have a FAT or NTFS filesystem or (b) the partition must been deleted. I would assume the first partition originally was created but wasn't formatted when it was put in the MAC. Not having a MAC I couldn't test it's behavour with partitions and USB sticks. I know Linux will happily see all partitions on a USB stick. Unless the first partition wasn't originally formatted , in which case that could be why the file wasn't immediately viewable on the mac and was viewable on the pc. The partition table is EFI , which is the default format mac's make. The file was extremely fragmented. Not a normal situation , shows extreme fragmentation or unusual circumstances. ### Provide the MD5 of the recovered file. Can't do that as I have removed all of the section which has a header of 0xFFE2. I couldn't find any info regarding that part of a jpg which would help me to find the missing parts. After finding the header and footer if searched for 0xff00 to find the image data. 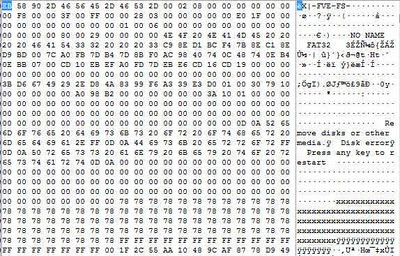 My method was to use a hex editor and combine the parts manually. I used encase to find the pictures header. Then tried data carving it with "revit" which didn't find anything. So researched the JFIF file format and found out what I could about the format and the headers in the file. Searched for the most important headers and found the following. Exported all chunks with the above headers. Found that JFIF files use byte stuffing and 0xFF00 is used to represent 0xFF , so searched for all blocks containing 0xFF00. The size of the FFE2 section was fairly large and I couldn't easily find any details about it's format , so removed it. Connected sections FFD8 , FFE0 , FFE1 , FFDB , FFC0 , FFDA together. The resulting JPG wasn't quite correct , so changed the order until it displayed correctly. This gave me the first two rows of numbers and half the HDD picture. I search further and found all the other sectors with 0xFF00 . Luckily I had started from the beginning as they were all in order and then appended them one by one until I ended up with the correct image. Appended the footer when I had run out of data. It was not an easy puzzle. Was a good challenge !! 427586, 427587, 427588, 427589, 427590, 427591, 427592, 427593, 427594, 427330, 426497, 428505, 428434, 428433, 427750, 427749, 427751, 427712, 427713, 428685, 428686, 426442, 426443, 426718, 428457, 426858, 426859, 426878, 426879, 426172, 426188, 426208, 426228, 426246, 427202. This flash drive was partitioned and formatted using a MAC. The default was to use a GUID partition table. This caused two partitions to be created. The first partition is used as the GUID partitioning config and the second is actually the usable one. When used on a MAC, there is no problem and just one partition is seen (the second one). When inserted into a Windows XP machine, the OS says the flash disk needs to be formatted and when you choose "yes" to format, it only formats the first partition (The one containing the GUID partition information) which is only 200MB in size. So in this case, I had a flash device that was 4gb, but the actual reported size in Windows was 200MB. I then deleted the second partition after "laying" down the fragmented JPG. I manually assigned each piece to each sector using the diskmap tool by Tim Coakley (http://www.simplecarver.com/software.php?cat=All). This tool allowed me to created the highly unusual, but not impossible, fragmentation and disorder among all the JPG pieces. I then reformatted the second partition using the MAC. I admit that it is not often that you see the beginning of a file *after* middle parts or even the end piece of a file, especially in a FAT file system, but I have to honestly say that I have seen this situation on real evidence before. To summarize, it's a simple JPG image with a text layer containing the 18 digit account number. I broke the account number into three parts, six digits each and placed the first part at the top, the second in the middle and the last part at the bottom, so if you started to recover the JPG you could start to see the account number, but not all of it until you got all the pieces (yes, it was evil). If you put the first 23 pieces together, you will get a partial image with the first portion of the account number, then you have to put the remaining pieces in order to get the rest. I was very surprised and pleased at the amount of emails and responses I received asking questions and providing comments about the practical. It indicated to me that there are a lot of people that enjoy doing these puzzles/practical, so I intend on creating some more and posting them shortly. Thanks to all that participated and congratulations to DANIEL WALTON!!!! Removable devices are now treated differently than internel hard disks and are listed below under the heading "BitLocker to go". When you encrypt a removable device, you are presented with a screen that lets you set your own password as well as other authentication methods. This is a change fromt he way Vista handles removable devices and the fact that the user can set the pasword. Normally, I get nervous when I see "autorun.inf" on any removable drive. But in this case if you don't have the autorun feature disabled in the registry (your should! ), then the "BitLockerToGo.exe" application is started. Once the application starts, it will then ask for the password that was set. 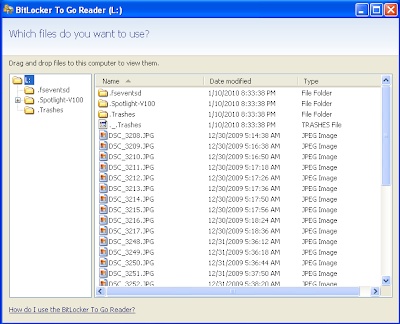 The BitLockerToGo Reader only allows a non-Windows 7 computer from *viewing* and copying files from the flash device. 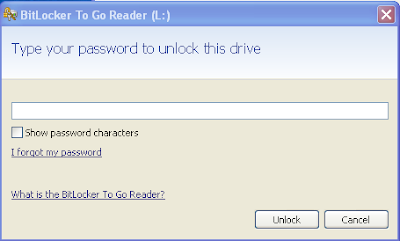 You cannot add files onto the device using the BitLocker Reader program. 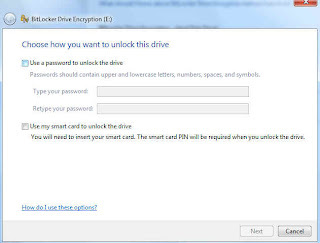 However, if you insert the removable device into a different Windows 7 computer with BitLocker enabled, you can access and add files as long as you present the correct password or smartcard. The COV file is the container file that actually contains the encrypted data. The example above was created on a 4GB flash device. 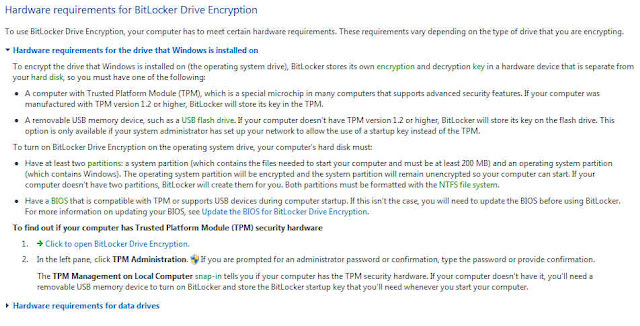 This last screen shows how to use BitLocker without a TPM chip. Just enable the "Require additional authentication methods at startup" and check the "Allow BitLocker without a compatible TPM" checkbox. The current version of EnCase (6.15.0.82) does not support decryption of a BitLocker volume created with Windows 7 with the EDS module as it does with Microsoft Vista. Your company has been contacted by a very wealthy and prominent business. They have one simple request. They would like you to do some data recovery and recover one simple file. The President of the company explains that he has a USB flash device that contained one simple file and that when he gave it to the company accountant (who uses a MAC), the drive suddenly became unreadable. The President advises you that the file contains the account number of a very important bank account and that he needs that 18 digit account number. Nothing else matters to him. The file is *very* important and he is willing to pay you whatever fee you demand if you are able to recover the file exactly as it was. Your mission, if you choose to accept it, is to recover the file and be able to tell the President (me) the account number (via email, please don't spoil it and post it in the comments, send to lance(at)forensickb.com). Can you hypothesize as to what happened to make the file "disappear"? Can you articulate the status of the drive and what, if anything is different that a typical flash disk? Provide the MD5 of the recovered file. I will provide an exact explanation of what was done to the device and file to those who submit answers so you can compare it with what you see. There is no encryption or hidden elements to this problem. This is a classic puzzle. For this scenario, I will be the "President" who lost the data and has contacted you. Feel free to "interview me" and ask any further information that you feel necessary, via the comment section (so everyone can benefit). This post is a New Year's present from Troy Larson. Troy emailed me a presentation a few days ago that he and Harlan Carvey did a few months back that outlines many of the changes with Vista and Windows 7. With his permission, I am posting the PPT, converted to PDF for everyone to benefit. Thanks Troy and Happy New Year to everyone!